The heart and character of a caring community begins with its people. We all can agree, the people of Kernersville go above and beyond in making this town special. 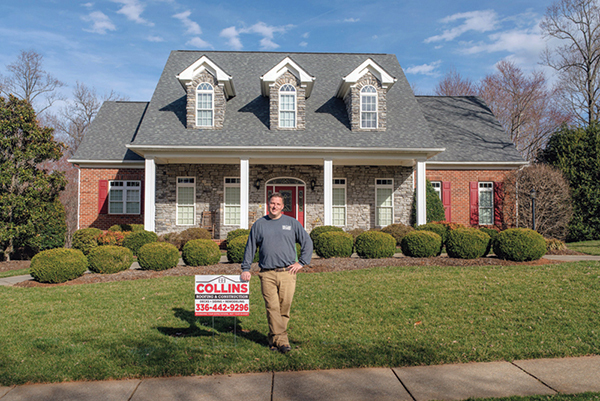 A good example is Jason Collins, owner of Collins Roofing and Construction, who was born and raised in Kernersville just like his mother Kay and father Richard. Although he misses the simple town of Kernersville from his childhood, he appreciates the current growth that reflects the excitement of living in our community. As a young man – when he wasn’t playing sports – Jason would work with his father to help older folks in the community with their homes; doing everything from mowing lawns to assisting with needed handyman projects. For Jason and his dad (who was employed full-time at Reynolds) it was all about helping the senior residents with chores and projects they could no longer do on their own. After graduating from East Forsyth where he enjoyed playing football as well as other sports, Jason attended John Wesley College in High Point where he completed his studies to become a Youth Pastor. It was then, in 2004, that Collins Roofing and Construction was formed and the two worked together for the next six years. The first thing that Gary taught Jason was, “You don’t have to make a month’s salary on one job. I just want to provide quality service at an affordable price.” It is this basic principle that has guided Jason from day one to the growth of his business today. Sadly, in 2012 Gary was diagnosed with cancer and passed away six months later. Before he died, Jason asked Gary if he could keep using the same crew that Gary had assembled. Gary’s answer, “If you take care of the people, treat them right, treat your customers right, then you are free to use them.” These same men are still with Jason today. “I am only as good as the people who work for me,” Jason proudly stated and explained the importance of having the right group of people needed to deliver consistent quality work. Jason is most proud of a project he founded a couple of years ago called, “Roofing for a Reason.” It came about when he had been referred to an elderly widow who had MS and needed an electric wheel chair to get around her home. More so, every room in her house had roof leaks. She had been quoted expensive estimates and she did not have the money to get the roof repaired or replaced. Jason decided to help this woman and started a Go Fund Me campaign. He was instrumental in helping bring the community together so they could raise the funds needed to purchase all the material and Collins Roofing and Construction replaced the roof at no cost to her. As Jason said at the time, “God is so good and I am thankful to be part of seeing the community come together to help someone they don’t even know.” Jason’s goal is to be able to continue to help other people in need by expanding this program. Jason is actively involved in the community either coaching sports or serving in the children’s ministry and youth group at Triad Baptist Church. But foremost, family is everything to Jason Collins. Spending time with his wife Rachel and their four daughters, Hannah, Sydney, Ryleigh, and Avery.